Challenge: Warm up the Muscles, Make hips more mobile. 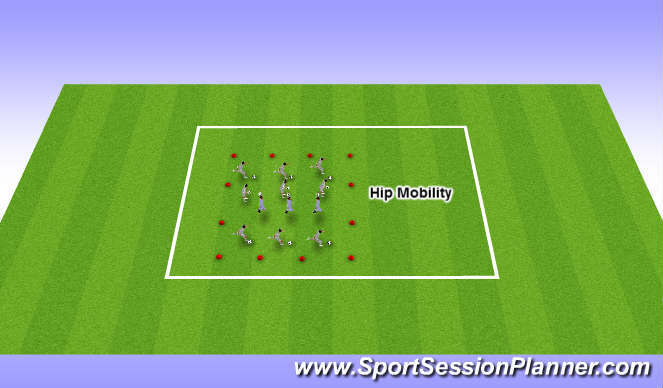 Physical: Get the hips more mobile, Open the gate, close the gate, lying leg raises with ball inbetween legs, Kick throughs ball in hand, touch the ball with foot, 2 x10 squats 2 x5 lunges each leg. Social: Players interacting with each other and supporting each other during exercise. Speed & Agility - Double toe taps through ladders, jockey the cones, weave through the poles, then shuttle from poles to cone and back. Then do it in reverse order. Teaching Points - quick as you can through the laddes, on the front foot (tip toes) same again when weaving though poles, nice and low when jockeying with a straight back. 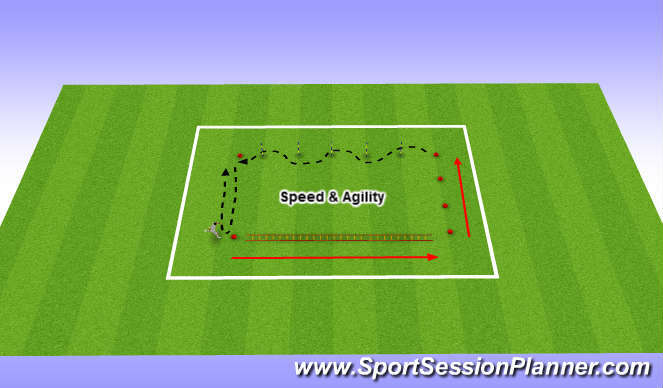 Looking For - Fast through ladders, slow down and jockey the cone, then back on the pace weaving through the poles, finish off with a shuttle run. Looking at change of pace and direction when changing speed.